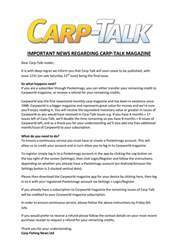 This week’s issue of Carp-Talk (issue 1044) is available to download now. 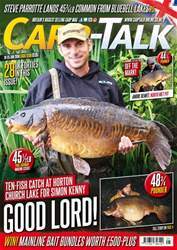 We look back at a fantastic UK Carp Cup final at Linear Fisheries’ Oxlease Lake and recap the Forces Carp Classic at Abbey Lakes, where Carp-Talk’s Bev Clifford was amongst the competitors. Rob O’Brien explains his one-bite-at-a-time approach, the Solar team offers some edges on targeting big carp this autumn, a change of weather brings some success for Daniel Leney, and Damian Clarke hunts down Eric’s Common. 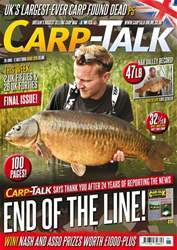 Products from ESP, Fox, CarpBaitUK, Trakker, Cygnet, 30Plus and CC Moore go under the spotlight in ‘Trade Talk’, there is £280-plus of Cygnet bankware to give away, and the winners of Wychwood Rising Stars are announced.